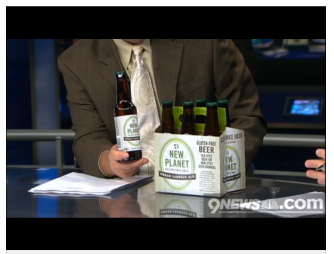 On June 2nd, New Planet Beer made it’s first TV appearance on the morning coverage of Channel 9News. If you were busy sleeping, you can still read and watch what they had to say on 9NEWS.com. 9NEWS thought Tread Lightly Ale would be a great “gadget for dear old dad,” for this Father’s Day and so do we! Share your comments and reviews of Tread Lightly Ale so more dads can appreciate its great, fresh (and healthy) taste.